Facebook is rolling out a new feature called Facebook Subscriptions that allows you to subscribe to public feeds even if a person is not your friends. It’s easiest to compare this new feature to Twitter or Google+, where you have the ability to follow public figures, celebrities, or politicians who look to reach a broader audience. If you click on the button you’ll start seeing that user’s status updates in your News Feed just as if you were Facebook friends. If you want to share your own status updates publicly, you can click a tab beneath your profile photo that says “Subscriptions” to find the option to broadcast to those who subscribe to you. Even if you broadcast your public updates you can still share more private updates with just your friends. The new subscription feature is also handy for people who want greater control over what appears in their News Feed. Facebook says the feature will help users decide what they want to see and what they don’t. My first thought is that the subscribe feature may seem a little creepy. Only because I think it’s strange to start subscribing to certain people and filtering updates. If you have to filter your friends facebook news feed with the subscribe feature are they really your friend to begin with? Personally I don’t think it’s necessary to have so much control over the feed. I either let friends feeds come through or I completely “hide all posts” by an annoying Facebooker. Help! 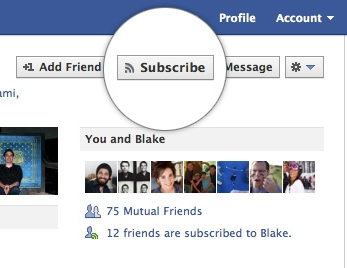 How Do I Adjust Facebook Subscribe Settings? You can adjust individual Facebook news feed subscriptions by hovering over a friends name in your feed then hover over “subscribe”. You can change how many updates you want to receive from a friend. All Updates – Receive all updates from your friend. Most Updates – I think Facebook will just filter out a certain number of updates, depending on how many and how often they are sending status updates. Only Important – Only updates that are marked as important (liked or commented on lot) I think this is similar to Facebooks Top News filter, but for individual friends. Photos and Videos – Turn off your obnoxious friends pictures and videos from showing up in your feed. 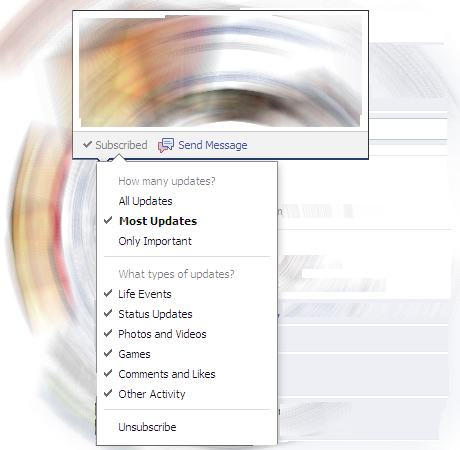 Games – Turn off those annoying game notifications (like Farmville, Questions Games Etc…) from your friends on Facebook. Comments and Likes – Turn off a friends Facebook comments or likes. You’ll want to change this for those constant likers and FB commenters! Other Activity – I’m not positive on what other activity there is. Any ideas? Please comment below! You Decide. Creepy Facebook Feature or Not? This Facebook Subscription post was just a brief intro to the new subscribe feature. We’ll have some more updates on this feature once it gets used more and we have more feedback. What do you think?